The show of strength continued in the Indian Equities as after spending major part of the session with very limited gains, the benchmark NIFTY50 inched higher, set yet another lifetime high and ended the day with net gains of 77.70 points or 0.72%. While the Markets consolidated until later afternoon trade, there was no sign of any profit taking and stock specific action continued with each minor dip being bought into. Speaking purely on the technical ground, since we have ended near the high point of the day, there are high probabilities that we see a modestly positive start and the NIFTY extending its gains, at least in the initial trade. 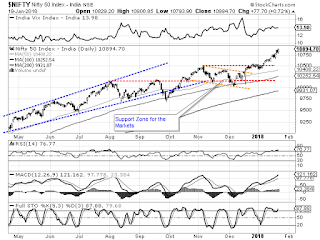 The levels of 10910 and 10965 will play out as immediate resistance levels for the Markets. Supports come in at 10845 and 10810 zones. The Relative Strength Index – RSI on the Daily Chart is 76.7650 and it has formed a fresh 14-period high which is bullish. It presently trades in overbought territory. Daily MACD remains firmly in buy mode while trading above its signal line. No significant formations were seen on Candles. The pattern analysis reaffirms the buoyant intentions of the Markets. It has now successfully moved well past the 10490-mark and is very near to the measured implication of resolution of the pattern. It would be very much critical to see if the Markets continues with the breakout or faces some consolidation at higher levels. All in all, the session on Monday and thereafter remains extremely critical. The NIFTY has ended above the upper Bollinger bad on both Daily and Weekly Chart. This should usually translate into continued up move and buoyancy in the Markets. However, the overbought nature of the lead indicators warrants some caution at higher levels. 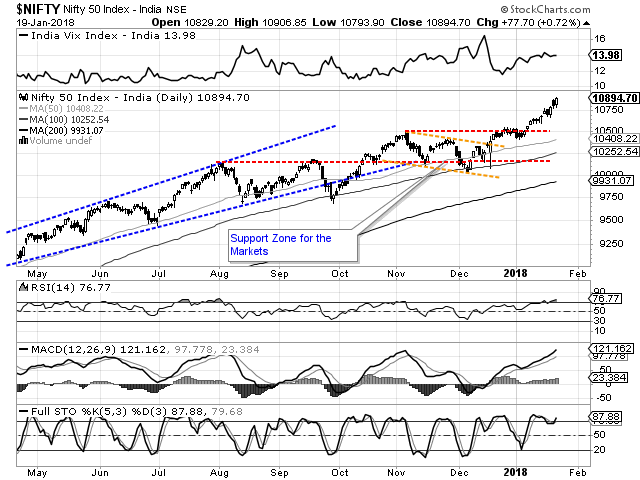 There are chances that before continuing with the up move, Markets faces some range bound consolidation once again. However, with undercurrent remaining evidently bullish, all weaknesses should be bought rather than selling all strengths.